Thanks to Dr. Martin Luther King Jr. Day, I had no school yesterday (actually, I have no school today too because of the “snow”, so I guess that makes it a four-day weekend), and, of course, what better thing to do during long weekends than go birding? On Saturday I went out to Montauk Point with a few friends, and despite the relative lack of activity out there, I thought we saw some great stuff. We had close views of many Razorbills sitting on the water at the point, plus 40 thousand scoters of all three species. 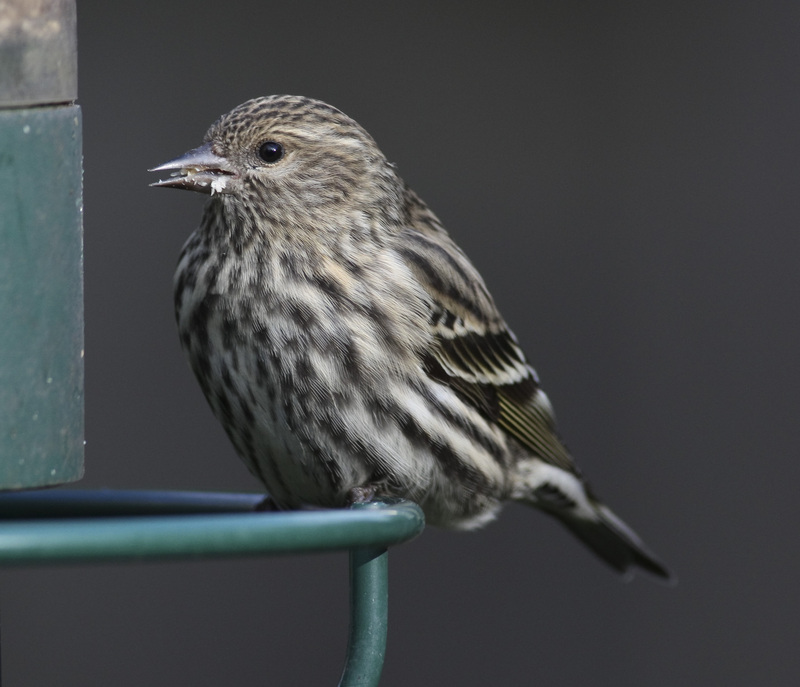 At Camp Hero, we heard a probable White-winged Crossbill flyover, though we unfortunately couldn’t get eyes on it. 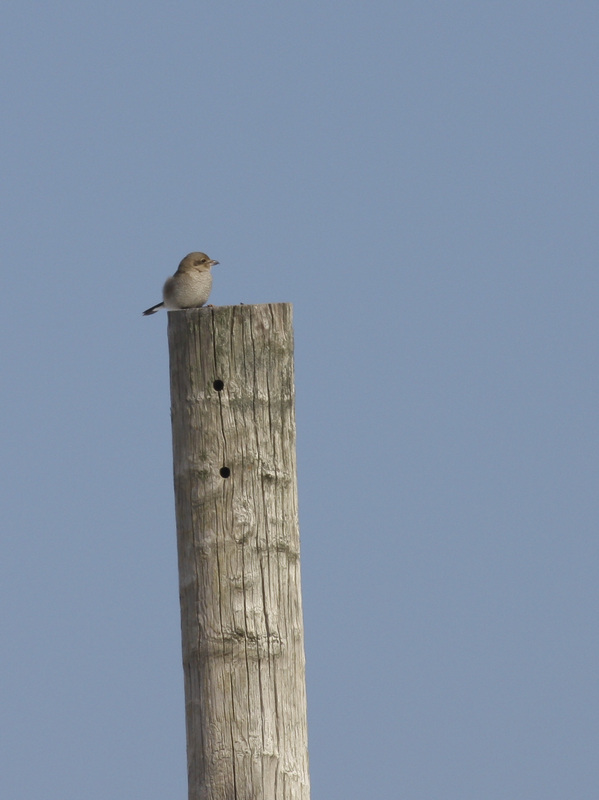 At Culloden Point, on the west side of the Lake Montauk inlet, we found a second-cycle Iceland Gull, and at Lazy Point in Napeague, I spotted a young Northern Shrike perched on top of a nearby telephone pole–so I’m not complaining. 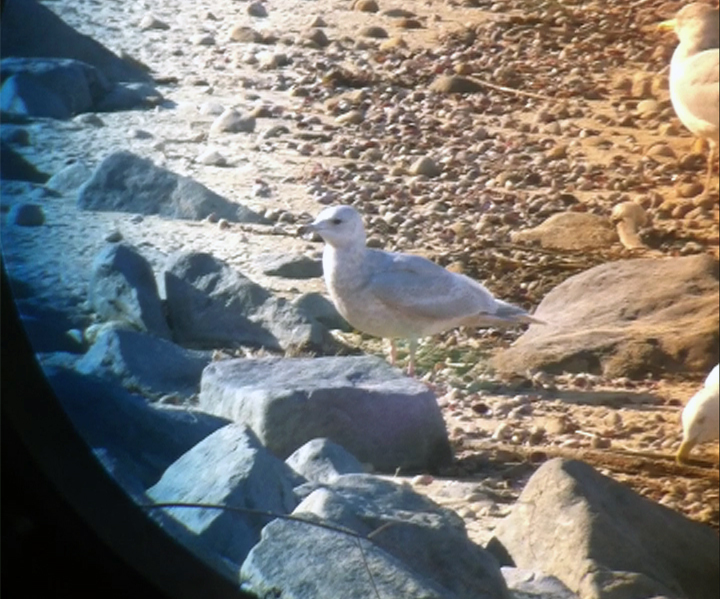 A poorly phonescoped image of the Iceland Gull. On Sunday, I couldn’t get out for some really intensive birding, but I did manage to pick up a new bird for my county–Northern Pintail–thanks to eBird! 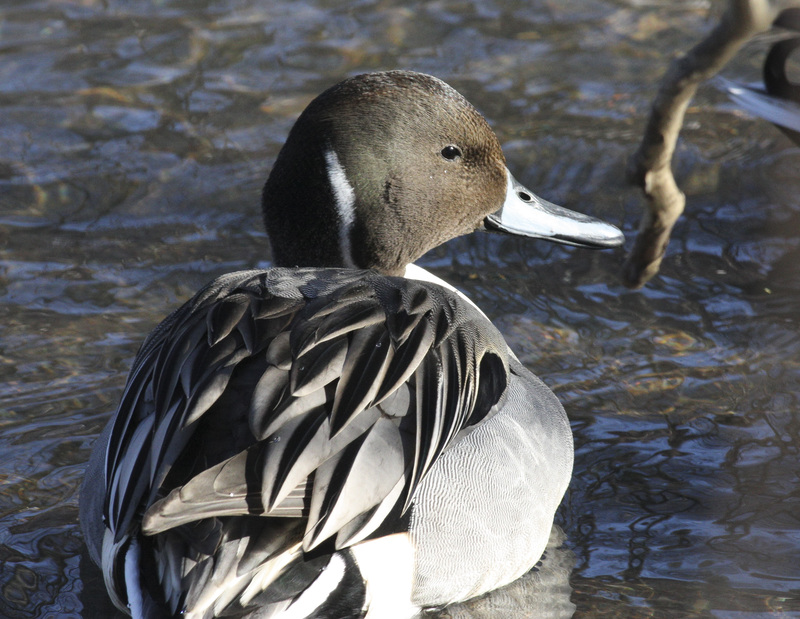 Northern Pintail--so close, I couldn't fit its tail into the frame! Then, on Monday, I took a trip down to Veterans Memorial Pier in Brooklyn to try and locate two Black-headed Gulls that have been there for weeks. We arrived relatively early (~8 AM), but there were only a few gulls actually roosting on the pier, and none were the ones we were after. However, there were hundreds of gulls in the water, so we commenced sifting through them, with a very cold wind buffeting us from, it seemed, all angles. 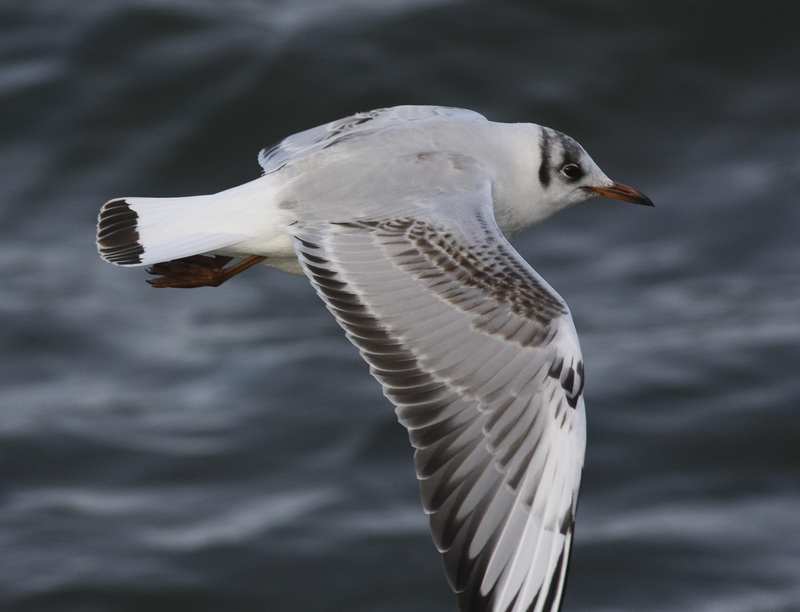 There were several Bonaparte’s Gulls around (like the one above), which look similar to Black-headed, but with some key differences. 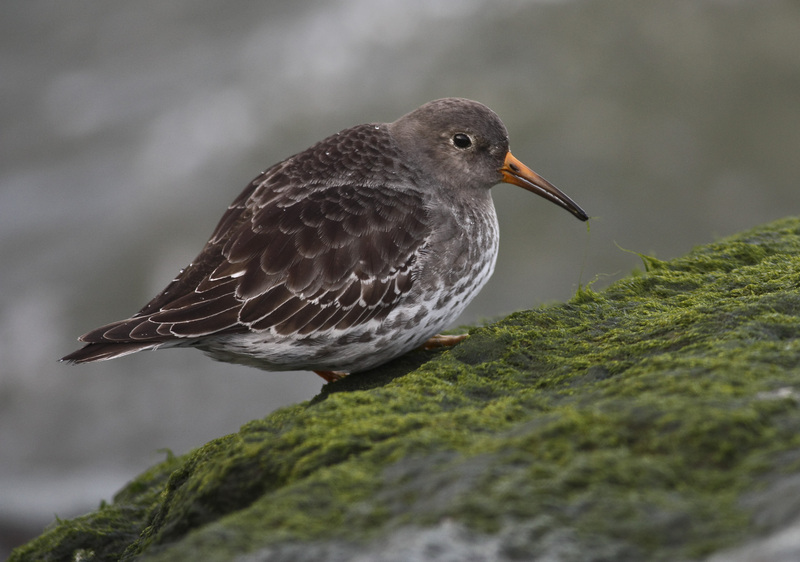 So when Jacob spotted a young Bonaparte’s with an orange-colored bill…it wasn’t a Bonaparte’s! 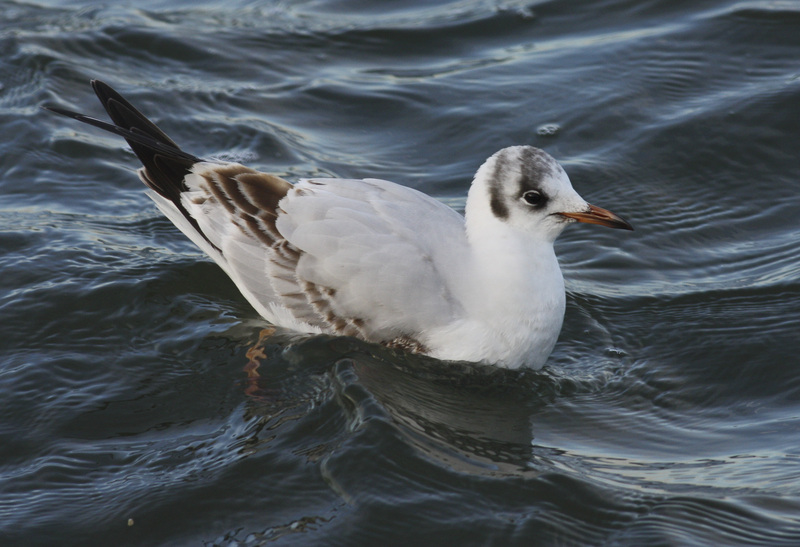 This first-cycle Black-headed Gull gave incredibly close looks. 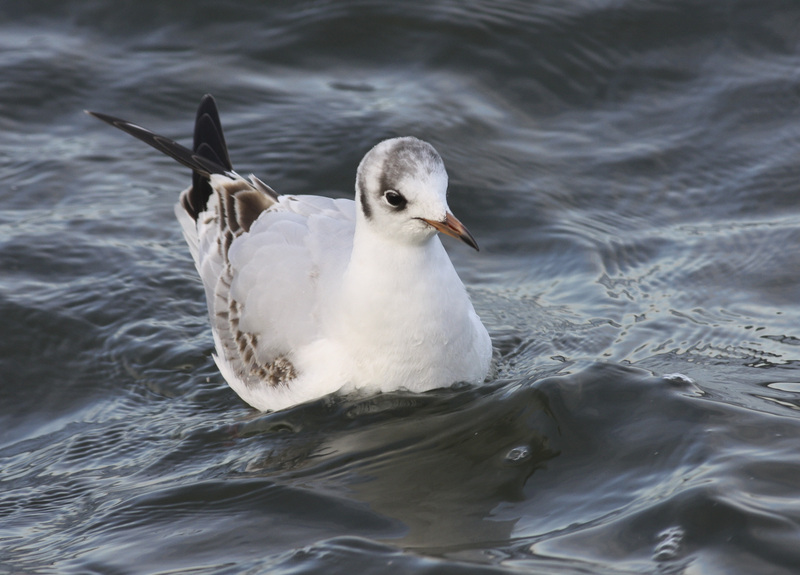 The Black-headed Gull showing its thicker orangeish-colored bill with a black tip--a key difference from Bonaparte's (above). 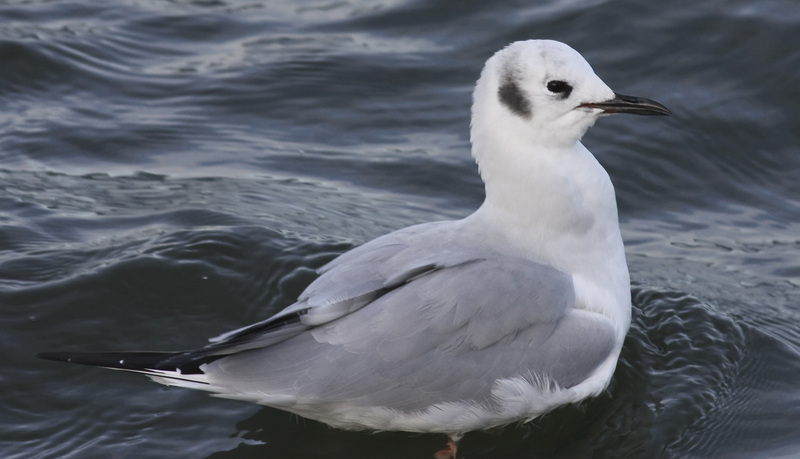 This individual also has more extensive dark markings on its head than a typical Bonaparte's. In flight, notice the prominent white wedge in the outer primaries (a FIRST-CYCLE Bonaparte's would show a lot more dark there). 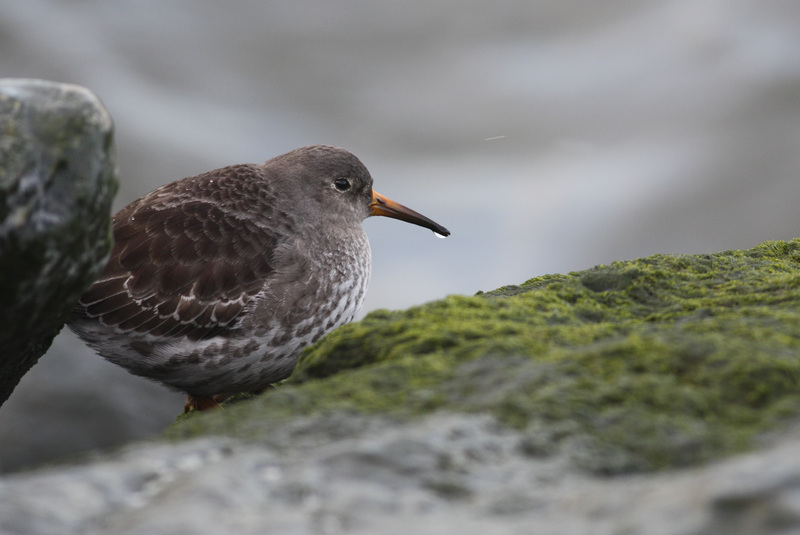 There were also a few Purple Sandpipers scattered along the rocks. We took a couple breaks from watching the gulls to snap some photos. They were, interestingly enough, not very skittish. 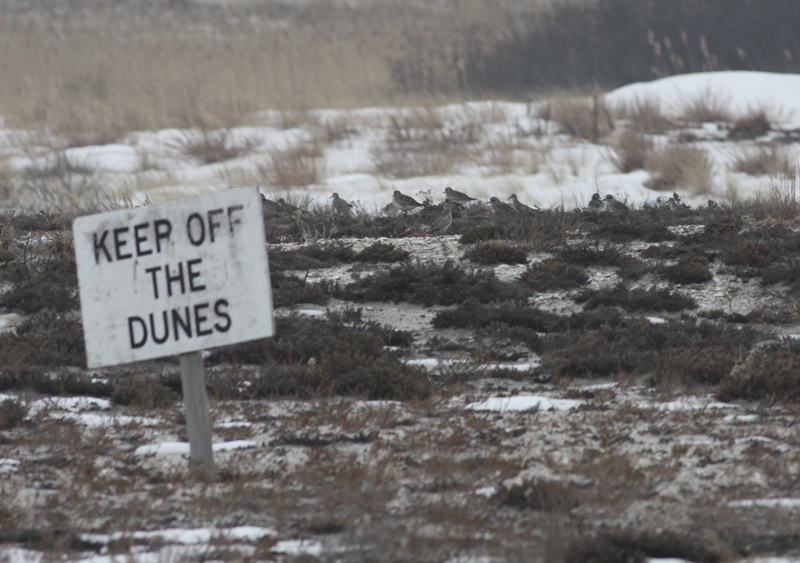 Apparently these Black-bellied Plovers and Red Knots can't read. It’s 3:30 AM on January 1st, 2011, and my alarm clock is beeping. Two hours of sleep, not bad, considering the date. Time to finally start off the year right! Fast forward an hour. I, with a few other intrepid birders, are on the way to the barrier beaches on the south shore of Long Island for the Southern Nassau County Christmas Bird Count. Not far away, the answer comes, “CKSHHHHH!”. We continue the rounds, finding no other Barn Owls on our pre-dawn circuit. An American Woodcock in the headlights makes for a great second bird, however. 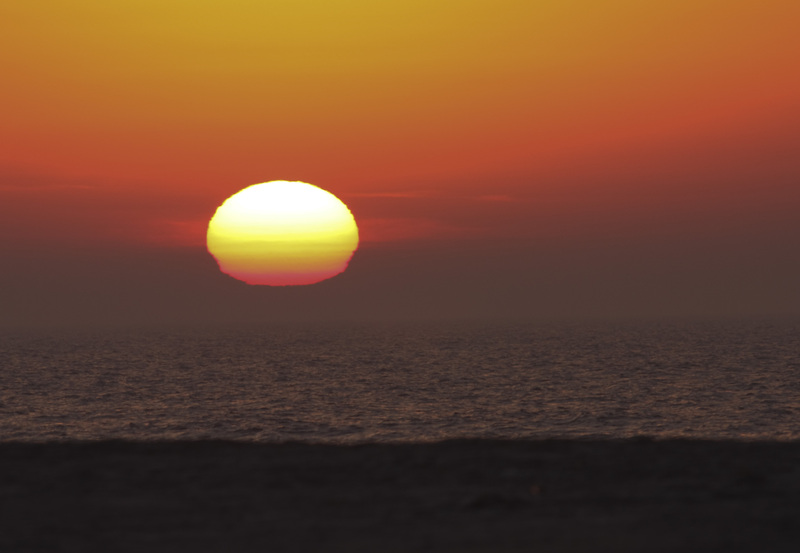 It's dawn, and you know what that means: a seawatch from Jones Beach! As the sun begins to rise, we head to the beaches. 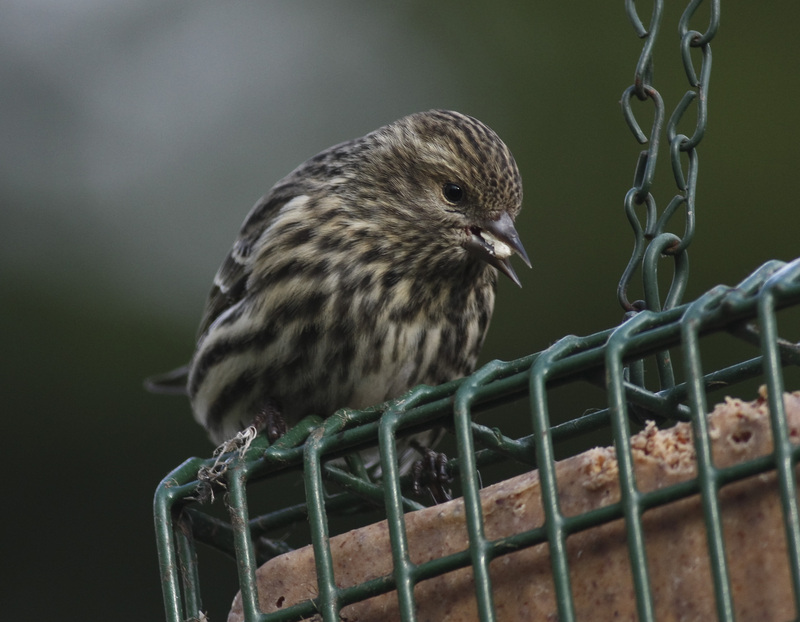 In the parking lot, five Common Redpolls fly over the car. Snow Buntings rattle as they whirl over the beach. There are all three scoters on the water, plus Common Eiders, Bonaparte’s Gulls and thousands of passing Dunlin. 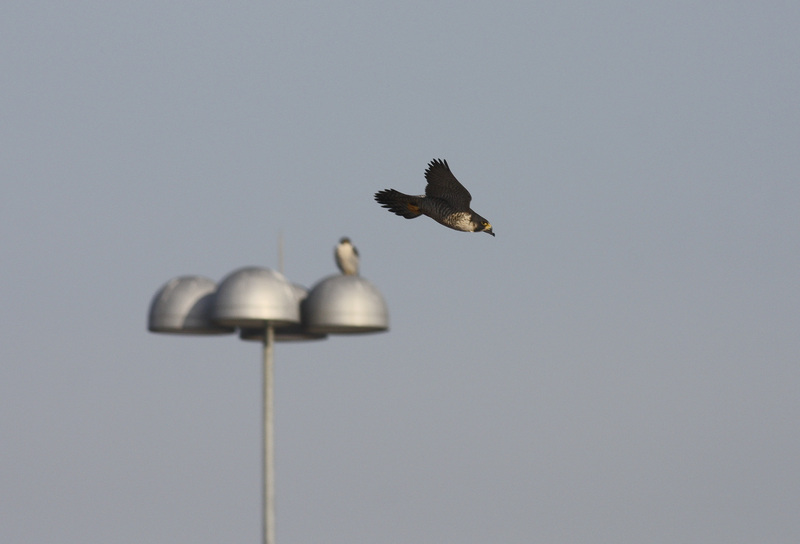 On the way back to the car, these two Peregrines put on a show. 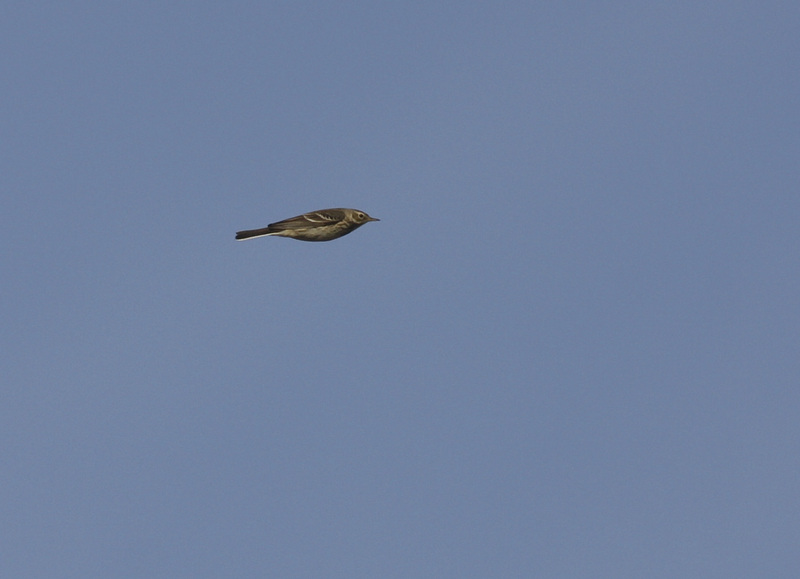 We saw 47 American Pipits during the count, including this one (from a flock of 20). As the day progresses, we tick off most of the common species (one surprising miss is American Goldfinch!). A final search for Short-eared Owls as the sun sets proves fruitless, but it doesn’t dampen the mood–a great first day of the year! 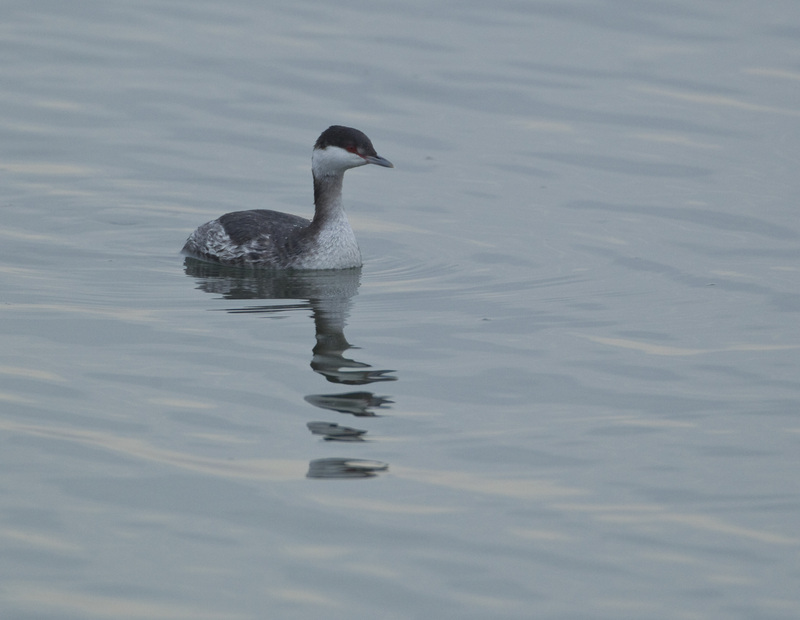 A close Horned Grebe at Pt. Lookout, while we were looking at some Harlequin Ducks. eBirdathon 2011 Update: More counties! Due to overwhelming interest from nearby counties in the state, we have decided to expand the eBirdathon 2011 contest to also include Rockland, Orange, Putnam, Sullivan, Ulster and Dutchess counties, in addition to the eight previously announced. The contest will now span all of Kingbird Regions 9 and 10 as defined by the New York Ornithological Association. As before, official information is available here: https://warblings.wordpress.com/ebirdathon-2011/. 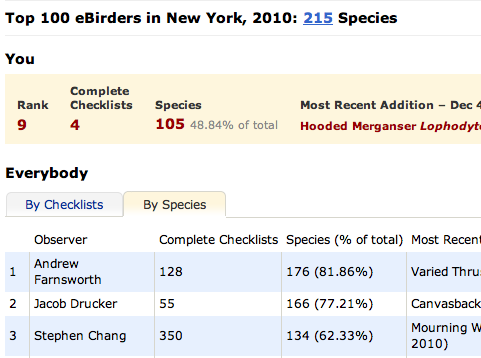 Rankings, when generated, will be available here: http://novahunter.blogspot.com/2010/12/nyc-area-ebird-thon-2011.html. Many thanks to the Cornell Lab for providing the additional prizes. Hi everyone. Sorry it’s been so long between posts, but I’ve been collaborating on a really cool event for next year. 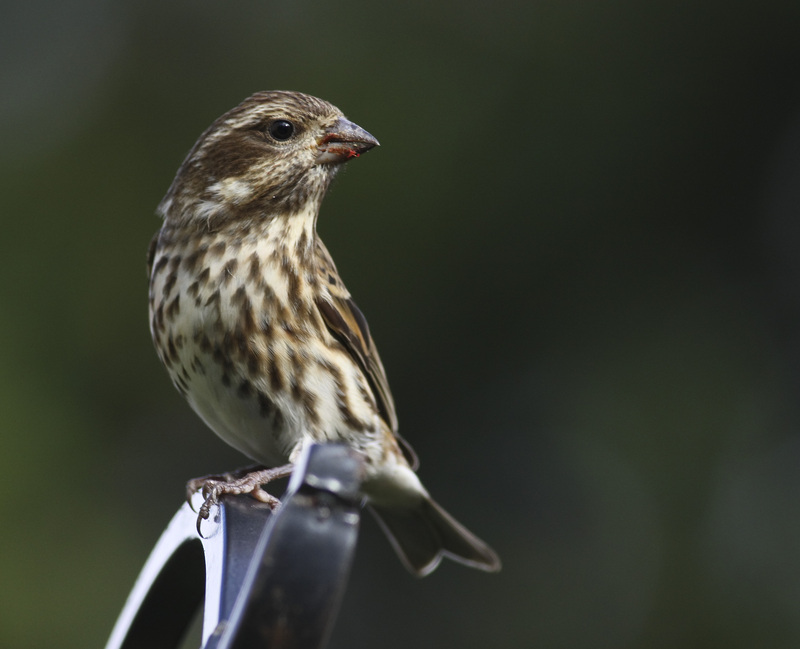 It’s a yearlong contest called eBird-a-thon 2011, and it will take place in the eight NYC Metro Area counties: Bronx, Kings, Nassau, New York, Queens, Richmond, Suffolk, and Westchester. Update: Now also including Rockland, Orange, Putnam, Sullivan, Ulster and Dutchess counties due to overwhelming interest. The goal of this contest is to submit both as many species and as many complete checklists to eBird as possible from your county, and winners will be decided by the existing Top 100 page at eBird, which keeps track of eBirders with the highest number of checklists and species in a given geographical area. The catch is that a person’s standing in the contest will be decided by both their rank in terms of number of species AND number of checklists, so it is important to work on both! 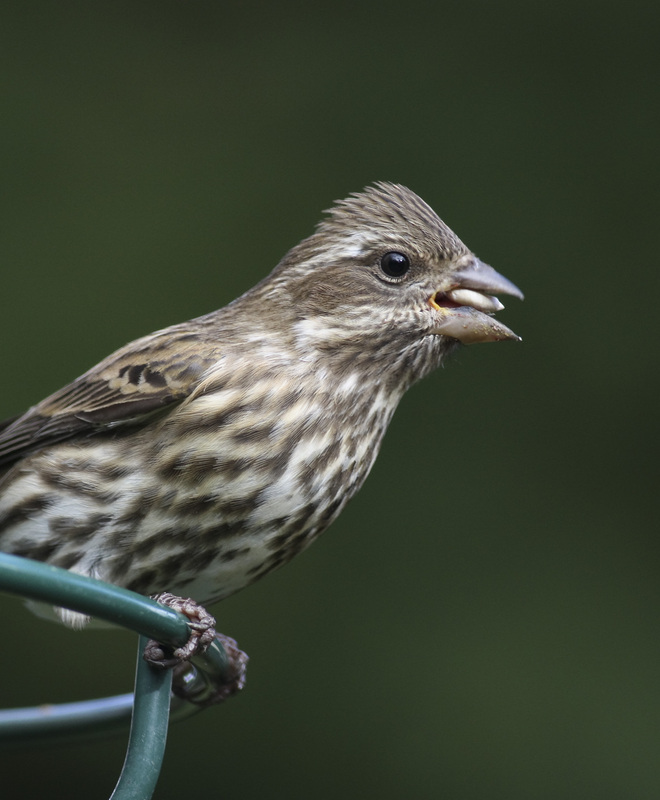 In particular, southeastern New York is home to a large concentration of birders who are already collecting invaluable data on a regular basis every time they go birding, and we’d love to see that information contributed to eBird (and through it, the Avian Knowledge Network) so it can be used in analyses of the birds we all care about and accessible to anyone. Indeed, eBird grows more valuable and becomes a more complete representation of avian occurrences as more birders contribute to its database, which already numbers in the millions of checklists. In addition, it is an easy and powerful way to keep track of one’s personal sightings. Ebird uses a user’s submitted observations to generate an impressive amount of birding “stats”, from worldwide life lists to month county lists, all of which can be very useful. A first, second and third place prize will be given out for each county, as well as cumulatively (adding up eBirders’ species and checklists from all eight counties). Prizes include subscriptions to Birds of North America Online and the CD Voices of North American Owls. In all, over $1300 worth of prizes will be given out at the end of 2011, donated by the Cornell Lab. The only requirement to participate is a free eBird account–if you submit a checklist in any county listed above, you’re automatically in the running. If you don’t yet use eBird, try using it to keep track of your 2011 year list. Or, if you already do, perhaps attempt a big year in your county! See the information and rules page (http://wp.me/PxRb4-vj). Once the contest begins, standings will be available here (http://novahunter.blogspot.com/2010/12/nyc-area-ebird-thon-2011.html). 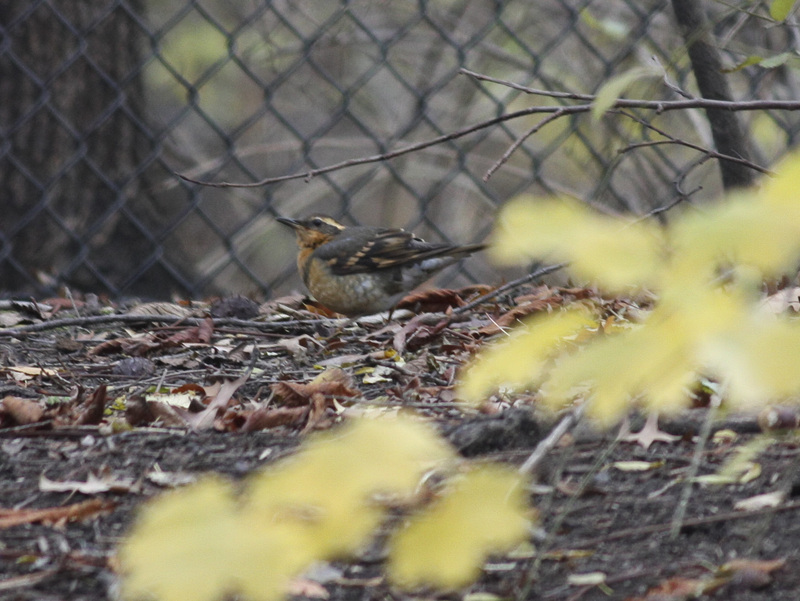 Today, Eamon and I took a trip to Central Park to see if we could catch a glimpse of the previously reported Varied Thrush. 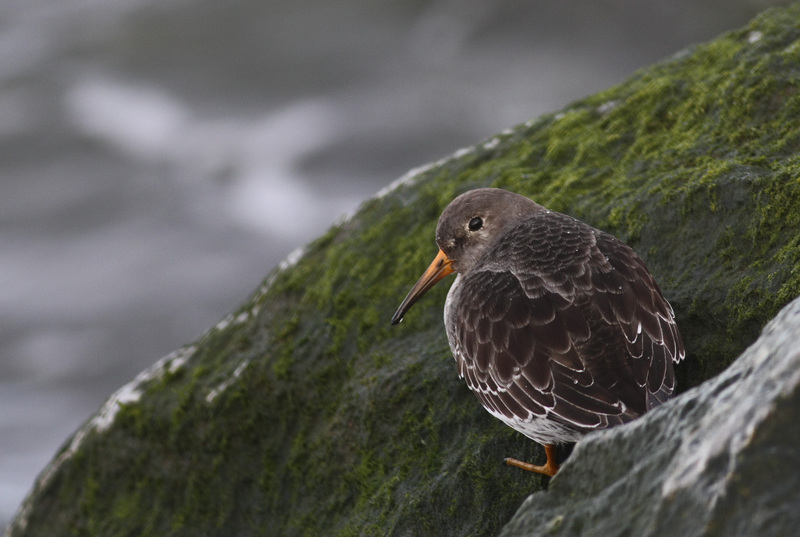 This is a bird that breeds in the Pacific Northwest, yet just about every winter a handful show up on the Atlantic coast. Ironically enough, I spent two weeks in coastal British Columbia over the summer, but managed to miss the bird in prime habitat. This was no doubt due to the mid-August date of the trip, after the birds had finished breeding and were no longer singing. 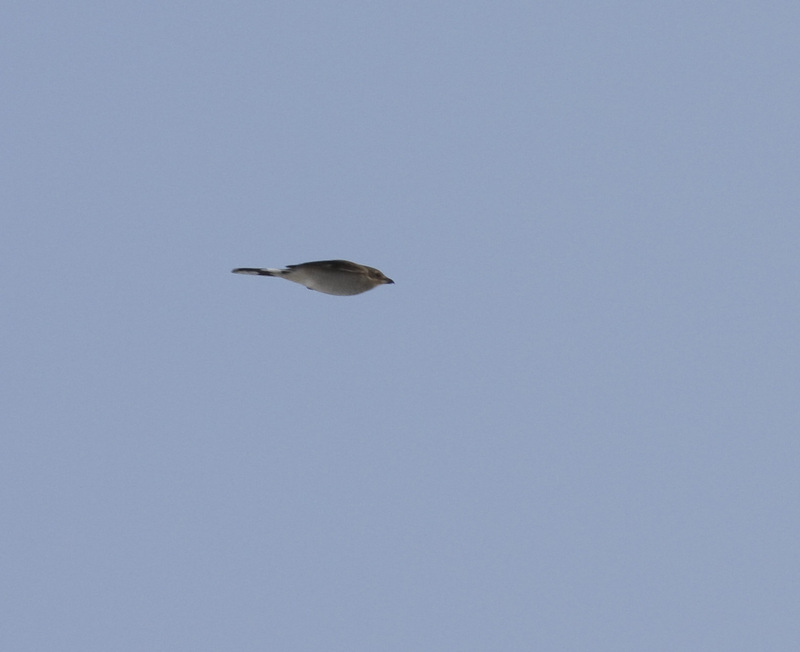 Still, it was frustrating, so this bird was one I particularly wanted to see. We got to the park at around 8:30 AM and headed straight for the Maintenance Field, where there were birders, but no bird. 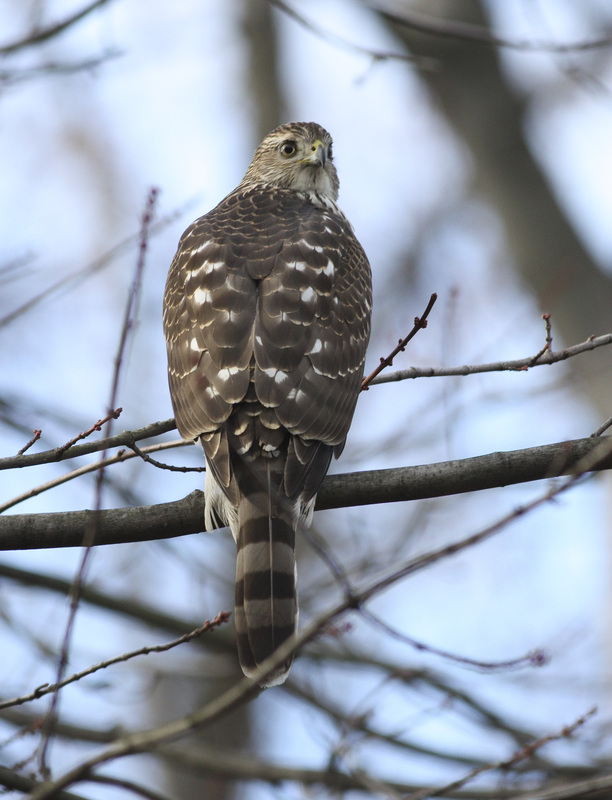 Apparently a Cooper’s Hawk in the area had caused all the birds to go into hiding. Fortunately, Eamon spotted the Varied Thrush high in a tree across the way, and a few seconds later it returned to its usual spot next to the Rambles Shed. Good looks for a few minutes, and then the bird retreated. We left and rambled around the Ramble for a while, finding nothing but the regulars. 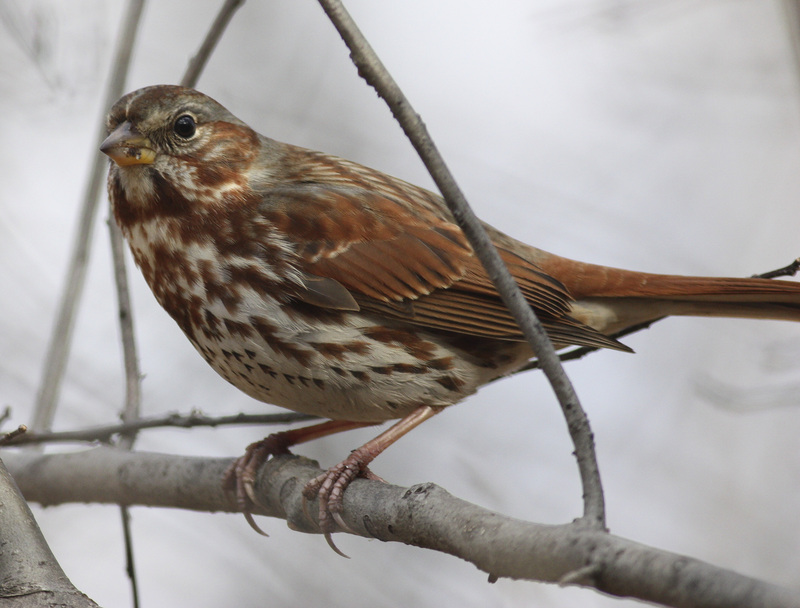 My first Fox Sparrow of the season. We returned to see if good looks were being had of the thrush, but I don’t think anyone had seen it since it disappeared on us. 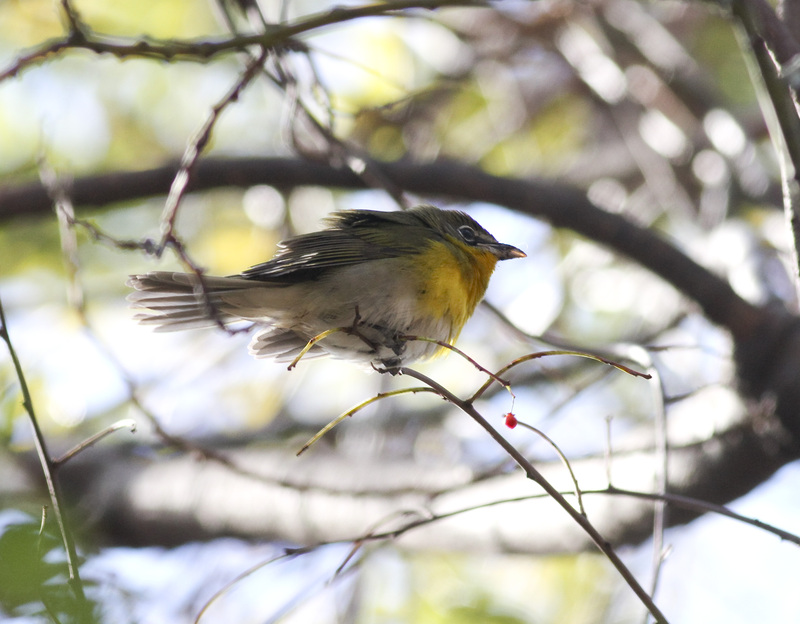 We went to check out a report of a Yellow-breasted Chat by the Boathouse parking lot, and in no time at all Eamon spotted it fluttering close to the ground. We followed it for several minutes, until it flew into a dumpster and then toward a flock of House Sparrows by the Boathouse itself. Still, we had great looks. 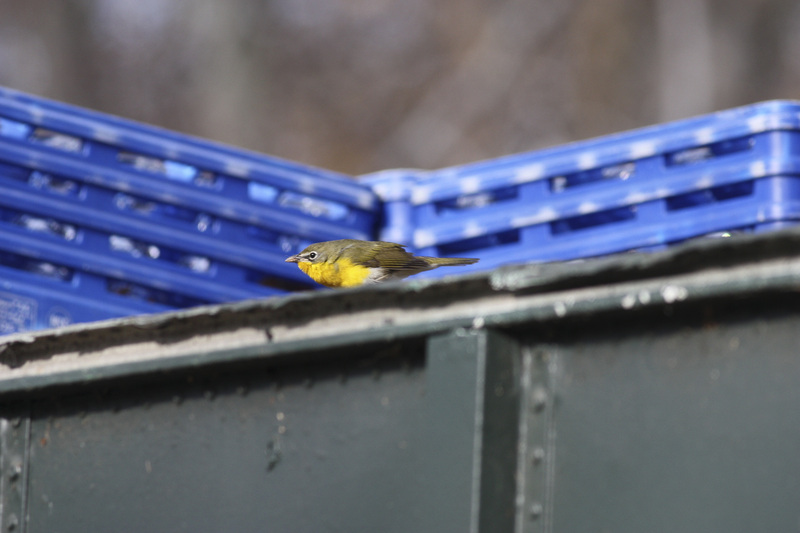 Yellow-breasted Chat in its natural habitat: the parking-lot dumpster. One last check of the thrush spot didn’t turn up anything. Today was the inaugural field trip of the newly formed Connecticut Young Birders Club. Close followers of this blog probably know that I’m actively involved with the New York YBC, but I couldn’t resist joining the CT crew–especially with some great birding planned for the day. Our destination: Hammonasset Beach State Park, one of the best (if not the best) birding spots in the state. As one of our leaders, Frank Gallo, put it (and I’m heavily paraphrasing here), a bad day at Hammo is a good day at almost any other place. Indeed, this proved true. 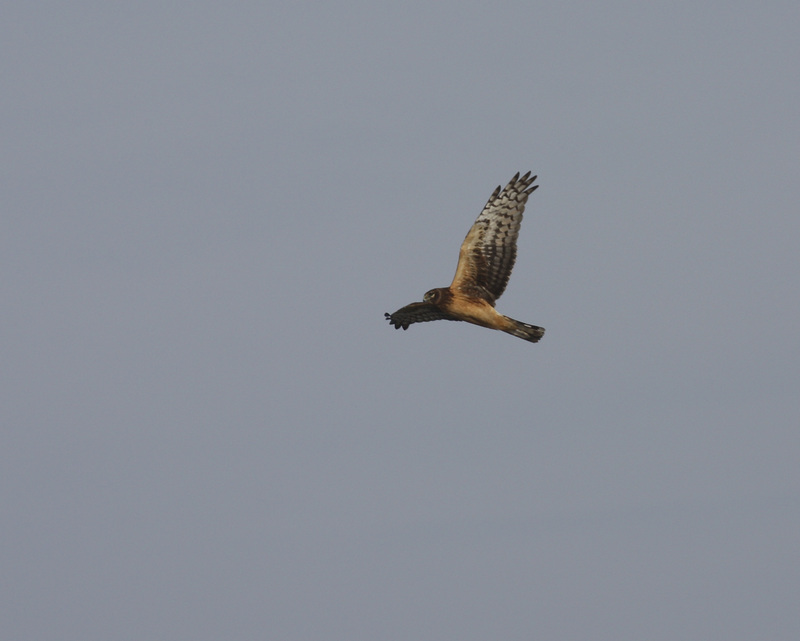 As one might expect in mid-November, there weren’t vast numbers of birds to be seen. But, those that we did see were pretty nice, regardless. One of our first birds was a Lapland Longspur, which did a terrific job of staying hidden in the grass (hence, no photos). 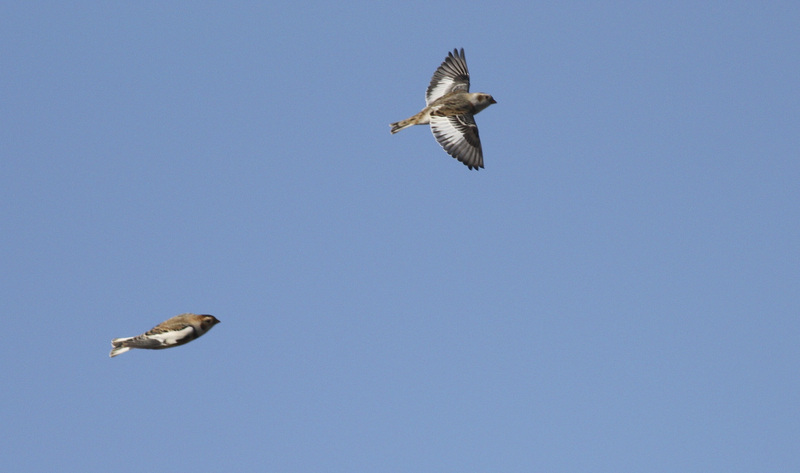 However, it was surrounded by good numbers of Horned Larks and Snow Buntings, birds that I never get tired of watching. Other nice birds at Hammo included eight Common Eiders and a lone Purple Sandpiper. We then drove to East Shore Park, the home of a sewage treatment plant. That’s terrific for birding, as the warmth produced by the plant attracts insects during the cooler months, which in turn attracts lingering insectivorous birds. We weren’t disappointed, as there was an impressive amount of late migrants, including American Redstart, Pine Warbler and Blackpoll Warbler. 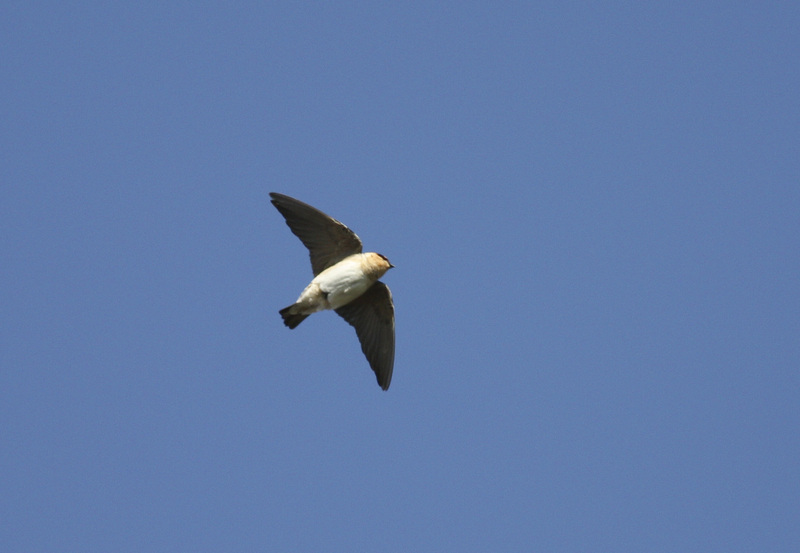 But, best of all, were two Cave Swallows–Mexican birds that, for largely unknown reasons, occur in small numbers along the coast in the northeast during November. I think I can safely say that this was a great first trip for CTYBC. Looking forward to many others! Well, it’s not officially winter yet, but some of the birds I’m seeing make it feel that way. 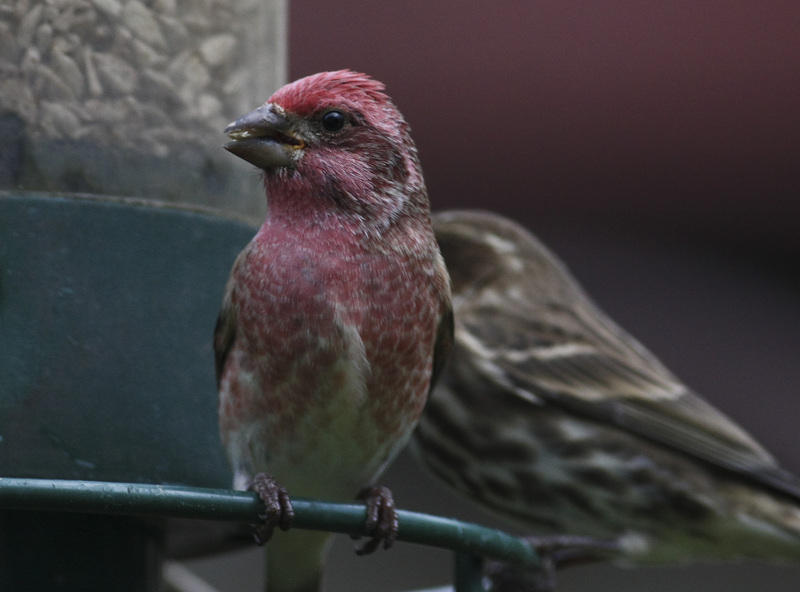 I’ve been lazy and haven’t put seed in my feeders since last winter, but last night I decided to fill them up, and look what greeted me just this afternoon!